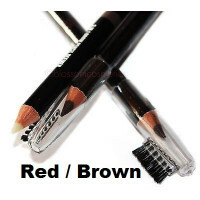 3 in 1 brow pencil definer. 3 smart steps for eyebrow perfection: 1 - Draw, 2 - Shape, 3 - Wax. Get your eyebrows the perfect shape with these fab brow twisters from W7! The angled pencil delivers soft strokes to give the effect of eyebrow hair.